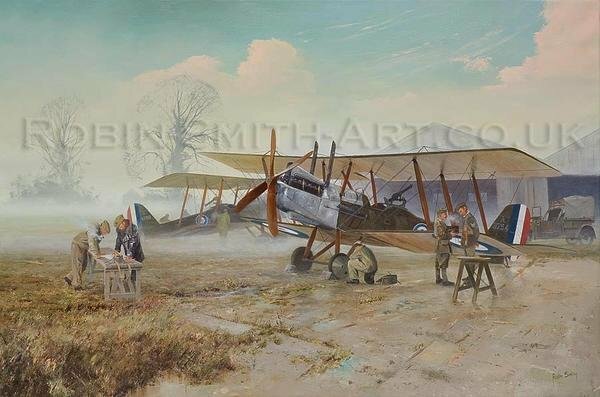 image size 16" x 10½"
The colours of the British aircraft during WW1 were not the most ambitious, usually painted in what's known as PC10 or (more appropriately,) Drab Olive. It can be quite a tricky colour to render as the PC10 specification actually takes in five shades, ranging from a brown khaki to a greeny brown depending on the era according to the historians, or quite possibly what was lying around at the time! Peter wanted a misty ambience to the composition, a characteristic I love to catch as it allows me to exploit my landscape techniques. The commission was in fact the second of a pair. The first subject was FE2b's. This title will follow shortly in print.